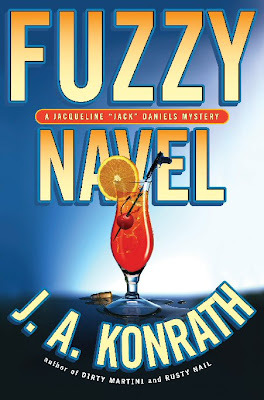 When I was sent the cover art for my latest Lt. Jack Daniels novel, Fuzzy Navel, I liked it. The cover designer kept up the theme of the previous four books in the series, which is extremely important when building a brand. If you've read this blog before, you know I'm big on branding. 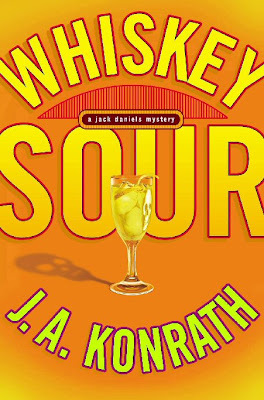 The fact that someone can go into a bookstore and say, "I'm looking for a mystery series but I don't know the author, or the main character, of the titles of any of the books, but I know they're all named after drinks" is not accidental. It's a calculated effort on my part to establish a brand. Covers sell books. 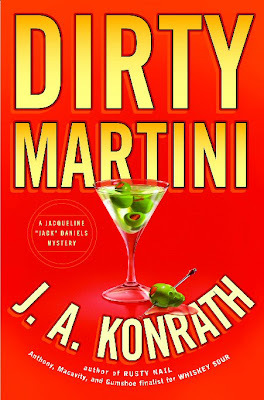 And having a consistent cover style, which can be recognized by fans by sight before they even see the book's title, is smart business. 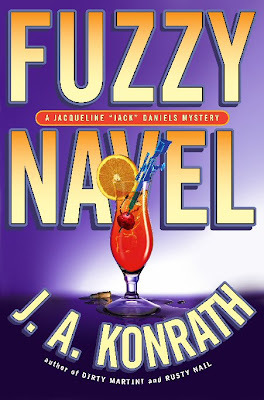 The newest cover for Fuzzy Navel fit within this theme, but I had a four problems with it. Three were issues of consistency, and the fourth was stylistic. "I like it, but have a few small problems. 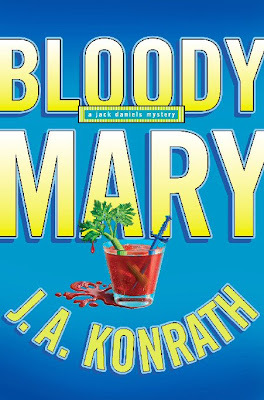 The biggest is that my second novel, Bloody Mary, had a blue cover. I'm worried that when future fans see the paperback on the shelf, they'll believe they already read the "blue" book, and miss out buying one or the other. How about purple as the background color? Also, one of the fun things about my covers is the hidden skull somewhere in the picture. This one doesn't have a skull. Maybe the cover artist can make the cherry into a skull? 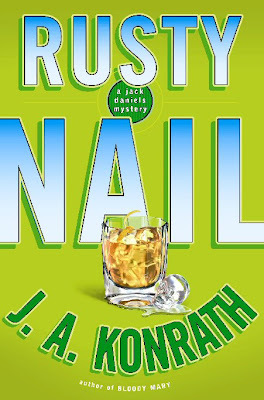 Looking back on previous covers, I also noticed that both words of the title are the same length, stretching across the whole cover. In Fuzzy Navel, the second word is shorter. Finally, and this is purely opinion on my part, I really don't like the gun on the swizzle stick. It looks like a spear gun. Is there any way to turn it into a sniper rifle, which is what the villains in Fuzzy Navel use?" My agent agreed, and forwarded my note to my editor. So they followed every one of my suggestions, and I think this cover works better. I also feel damn good about my publisher. They actually listened to me, when they could have easily done whatever they wanted to do. Points for them, and I'll remember this when the next contract negotiation takes place. While many of my peers believe that the only thing you can get out of a publisher is advance money, I remain unconvinced. Call me naive, but I think there's still room for loyalty, mutual respect, and an open exchange of ideas and information between writer and publisher. Ideally, these efforts should compliment each other, and each party should have a similar vision for the book or books, and a plan to make that vision a reality.